Can you successfully scrub for surgery? Many students get extensive practice performing procedures, but never get enough training on the proper way to scrub, gown and prepare to perform a procedure. This kit gives you the supplies you need to have 10 students practice the process of preparing themselves to perform a surgical procedure. 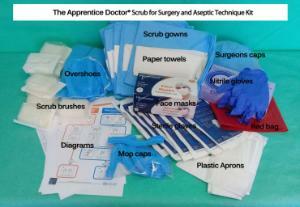 All materials are packaged as you would expect to find them in most surgical theaters. A great start for your first lab to introduce your students to the process, or use it as part of a final project where students need to perform a simulated surgery. This is even a good review for any group who needs to periodically perform in a surgical theatre. The included course is accessible on line for easy access. 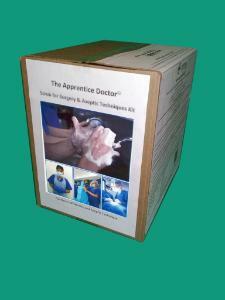 Accessories information: Try following this activity with the Apprentice Dr Fracture Reduction Kit.